The article aims at a reflection on the concept 'religious educational theology'. 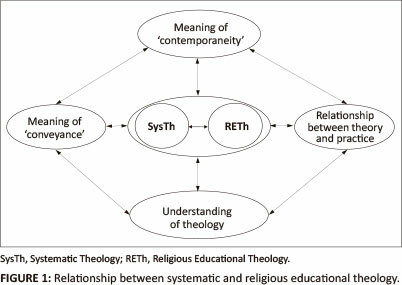 Three aspects are addressed, namely, (1) the relationship between 'catechetical theology' and 'religious educational theology'; (2) the potential significance of 'religious educational theology'; and (3) the relationship between 'religious educational theology' and 'systematic theology'. The notion of a religious educational theology is still quite uncommon (Rothgangel 2003; Bröking-Bortfeldt 2005), in contrast with the common notions of New Testament theology, Old Testament theology, biblical theology, systematic theology, practical theology or pastoral theology. On the basis of these terms, one can see a presupposition of my analysis which is not readily evident in the worldwide context of religious education. In this discussion, religious education is considered in its relation to theology. My Viennese colleague James Loader, as an Old Testament scholar, does not perceive himself to be only a philol6ogist, but consciously also a theologian. Similarly, I do see myself not only as an empiricist, but also as a theologian. 1. What is the relation between 'catechetical theology' and 'religious educational theology'? 2. What is the potential significance of 'religious educational theology'? 3. What relation exists between 'religious educational theology' and 'systematic theology'? The first two of our lead questions will be answered in the following part. It is remarkable to see that even a short review of the historical background yields indications of the possible significance of religious educational theology. In his Dogmatics published in 1664, Johann Friedrich König distinguishes between a 'theologia acroamatica' and a 'theologica catechetica' (König  1669: §23, 23). Acroamatic theology is the theology of doctors and preachers, and it can also be understood as systematic or dogmatic theology, both terms that were established in the 17th century (Pannenberg 1987:406-407). In comparison to acroamatic theology, catechetical theology can be seen as the 'raw' theology that can be found in all Christians (König  1669: §23, 23) - it is also sometimes characterised, somewhat negatively, as 'milky theology' or 'children's theology' (Bizer 1988:689). This negative meaning becomes obvious when one considers Hebrews 5:13: 'For everyone who partakes only of milk is unskilled in the word of righteousness, for he is a babe.' Given this background, it is not surprising that König does not elaborate on catechetic theology. However, the concerns of a catechetical theology are certainly taken more seriously by other authors and it even exists as its own literary genre. For example, a catechetical theology can be found in the literary estate of the famous theologian Johann Franz Buddeus (1752). This is of special significance for our topic, as Buddeus pleads that the term 'dogmatic' should not only be used to refer to systematic theology, but that it should also refer to the catechetical theology (Buddeus 1752:26). 1. From catechetical to religious educational theology: Religious education has more or less become the heir to catechetics. It is nevertheless imperative for the formation of theories in religious educational theology that the rich traditions of catechetics are kept in mind, and that some of its aspects are incorporated into the theoretical framework of religious education. In my opinion, catechetical theology forms a significant part of catechetics. However, one should bear in mind that times and conditions have changed; it would therefore be better to speak of a theology of religious education and not of a catechetic theology. It is no accident that the beginnings of religious education are seen in context of the Enlightenment or as closely related to the challenges of modernity. Considering the processes of secularisation, abandonment of traditions, individualisation and pluralisation of religion, an 'initial faith' in the catechetical sense can no longer be assumed, and the subject orientation of any education cannot be inevitable. 2. Taking religious everyday theories seriously: Religious education has made considerable achievements in the research of this field. It is no coincidence that the 'Yearbook for Children's Theology' (Jahrbuch für Kindertheologie, Bucher et al. 2002) has been published since 2002 and that a youth theology is currently being established (Schlag & Schweitzer 2011). In contrast to catechetical theology, it is certainly an advantage that an increasingly differentiated view of these age-specific lay theologies can be inferred through empirical research methods. This is a necessary contribution to a theology directed at real life that wants to be linked to contemporary communication. 3. Critical-constructive theological reflection on these religious everyday theories: 'Religious educational theology' should include the notion that religious everyday theories should be reflected more thoroughly from a theological perspective. In the language of children's and youth theology, we could say: a dialogue between the theologies of children and adolescents and the theology for children and adolescents needs to be started. This requires that teachers of religious education have to specifically seek dialogue, especially with biblical and systematic theology as well. One could even go one essential step further. In the Anglo-American context, Geoffrey Wainwright presented a concept that attracted much attention. He took the church service as a starting point of theology, and identified it as its theme and source. He also seemed to be very open-minded about a different concept that takes religious education as the topic and source for theology. In contrast to the sphere of activity of the service, interesting additional motives for a contemporary theology become apparent in religious education, which can also be characterised as an interface between church and society. This brings me to the second aspect and the third question. Like catechetical theology, religious educational theology also has a related discipline in systematic theology. Therefore, religious educational theology also takes on a clearer shape when it is compared to systematic theology. However, before a relationship between systematic theology and religious educational theology can be shown, I will provide an account of the conditioning factors that influence this relationship. Figure 1 is not meant to show all the possible conditioning factors, but it provides a primary orientation. The relationship between systematic and religious educational theology is at the centre of our attention. This might sound obvious, but this relationship is mainly determined by the respective understandings of systematic theology and religious educational theology. I also want to illustrate this with well-known examples taken from religious education (Wegenast 1984). Firstly, if one holds a view of religious education in which not theology but rather religious studies are the main reference discipline, then religious education has in a way moved out of the 'house of theology' and therefore become independent of systematic theology. Secondly, if like Heinz Schmidt (1977:96f.) one holds the opinion that theology is the primary reference discipline for religious education, and that in the 'house of theology' systematic theology is central to interpreting the Christian message comprehensibly in each presence, only the task of translating previously clarified matters are left for religious education. Religious education thus becomes a dependent variable of systematic theology, which is also called the 'model of dominance'. Yet even if one argues for a location of religious education within theology along with Schmidt, this does not mean that a model of dominance must follow from this approach. In my opinion, a more differentiated discussion becomes easier if one expands one's horizon and takes a look at four conditioning factors. The first conditioning factor is that an individual understanding of theology is essential for determining the relationship between systematic theology and religious educational theology. I want to illustrate this with two classic examples. On the one hand, the basis for Schmidt's 'dialectical theory' of religious education is, as suggested by the name, formed by Karl Barth's 'dialectical theology.' According to Barth, theology is by no means a self-expression of a religious consciousness, like it is for Schleiermacher, but it is rather the doctrine of God. Such a doctrine of God, however, can only exist as repetition of God's self-revelation in his Word that has emerged in Jesus Christ and is attested to in the Bible. Against this background, the model of dominance supported by Schmidt should no longer seem surprising. On the other hand, what happens if one takes Paul Tillich's theology as a frame of reference to establish the relationship between systematic and religious educational theology? According to Tillich, the object of theology is that which concerns us absolutely, and therefore, the things that decide over being and not being (Tillich 1987:19). His method of correlation seeks to relate the questions that are contained in the situations and the answers contained in the message with one another: it does not derive the answers from the questions, nor are there answers that are not related to the questions. The second fundamental conditioning factor is the determination of the relationship between theory and practice. Both systematic theology and religious education are theories, but because of its closer connection to practice, religious education becomes more important in the wider context of theology if the practice is not only derived from theory. According to a widely held opinion, however, theory seems to take precedence over practice, and theory is seen as an independent achievement of perception. In this case, practice is only an application of the theory, and will therefore not lead to new understanding. Three aspects can nevertheless be identified where, at least in the practical-theological context, an equal opposition of theory and practice would be helpful: first of all, practice is both an object and a requirement of theory; secondly, it can be used as a test of and an expansion on theory; the third aspect is that practice always contains theory. In the ideal case, practice and theory meet as equals (Hemel 1986:110). If practice sees theory as its enemy, it becomes blind to alternative courses of action; and if theory becomes too far removed from practice, it leads to an alienation between itself and the actual requirements of church and school. The third conditioning factor, the meaning and the importance of 'conveyance', became apparent to me whilst reading one of Pannenberg's interviews. When asked how contextual theology could be and might be, he said that '[t]he conveyance of faith is primarily the task of the sermon and not of theology. Theology first and foremost has to inquire the truth and the contents of faith' (Pannenberg 1995). According to Pannenberg, therefore, it becomes clear that conveyance of faith and its contents is not really a task of academic theology. Even if it were, it would be a very minor task. The implications for the determination of the relationship between systematic and religious educational theology are obvious. However, we cannot differentiate between the scientific question of truth or content on the one hand and its conveyance on the other hand in the way Pannenberg suggests. With good reason, the systematic theologian Wilfried Joest ( 1997:90) emphasises that conveyance itself forms one of the primary tasks of theology, as the aspect of conveyance is deeply rooted in the essence of faith. Against this background it will not come as a surprise that according to Härle, even a systematic theologian would object to burdening priests and religious educators with the entire load of the conveyance of faith (Härle 1998:371). If conveyance is reevaluated in this way, religious education as well as the other disciplines of practical theology gains importance. Contemporaneity as conditioning factor by itself would provide enough material for an entire presentation, which is why I have to restrict myself to brief remarks at this point (Figure 2). 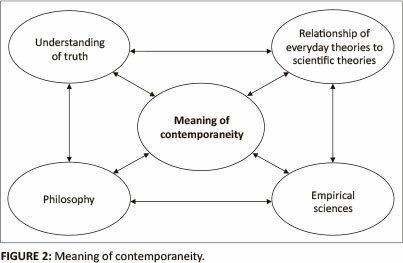 To be able to determine the relationship between systematic and religious educational theology, the criterion of 'contemporaneity' has to be defined first. Is the dialogue with philosophy sufficient? Or do we additionally also include empirical sciences, where in our case results and methods of religious psychology and religious sociology might be particularly relevant? In my opinion, methods of the social sciences, such as grounded theory, are especially suitable for perceiving the religious everyday theories of children, adolescents and adults in a more differentiated way. One question arises: what weight should be assigned to the everyday theories in comparison to other scientific theories? From the point of view of the sociology of knowledge, it is remarkable that at least in specific situations, everyday theories have an advantage over scientific theories. However, even from a philosophical standpoint it should be asked in what respect the theology of children, of adolescents and of adults is less 'true' than systematic theologies. One should not dismiss such questions too easily. If I see it correctly, then it is not irrelevant to consider one's own understanding of truth to be able to answer these questions. If one follows the correspondence theory of truth, then this question would be answered very quickly; however, if one pursued a consensus theory of truth, then this question might just remain unresolved. Independent of the answer to the question of truth I hope that it has become apparent that the development of a religious educational theology is a goal for religious education, as in the end it would provide a basic theory for a children's, youth and adults' theology. Note: This article is dedicated to Prof. Dr James Alfred Loader. In terms of the official contractual arrangement of the academic relationship between the Evangelisch-Theologische Fakultät der Universität Wien and the Faculty of Theology of the University of Pretoria, Prof. Dr Martin Rothgangel is a research fellow in the Department of Practical Theology, chaired by Prof. Dr Yolanda Dreyer.